Fr. Meletios Webber is back from the Holy Lands! On a brand new Jottings from a Holy Mountain, the Abbott of the Holy Monastery of St. John of San Francisco continues his account of what he saw and shares his overall assessment of the trip. American Orthodox History is back! Host Matthew Namee speaks at the Fortieth Biennial Clergy Laity Congress of the Greek Orthodox Archdiocese of America in Atlanta, Georgia. On a new Glory to God, Fr. Stephen Freeman considers what it means to be a "convert" to the Orthodox faith within the context of modern American culture. Fr. Thomas Hopko begins looking at the 102 Canons of the "Quinisext," or the Fifth and Sixth Ecumenical Councils, sometimes referred to as the Council in Trullo. Maximus the Confessor is affirmed and many Patriarchs and Popes are anathematized. Many meals are eaten in the restaurant setting. On a new Food, Faith, and Fasting, Rita Madden provides strategies on how to eat in a spiritually minded manner at the restaurant and explains how these good food choices can benefit your health. Frederica Mathewes-Green reviews the latest Tom Hanks vanity project Larry Crowne, which not only features the actor, but was written, directed, and produced by him as well. Should the faithful be creating Orthodox colleges and universities? On a new Faith and Philosophy, Clark Carlton shares his thoughts on the place of Orthodox Christianity in the academy. How did the New Testament Church worship? Fr. 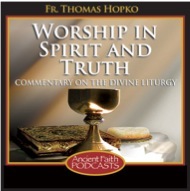 Thomas Hopko shows a specific structural practice that Orthodox worship today is based on.